"Tatooine" Planet Kepler-35b: "This piece went through numerous adjustments as William Welsh and I iterated back and forth about orbit lines, lightning on the planet's dark side, the brightness of the aurora, and more," Cook said. "Attention to detail is what especially impresses me when I work with research astronomers, as all of us strive to 'get it right.'" If you've read a few news stories about alien planets over the last decade and a half, you're probably familiar with Lynette Cook's work. Cook has been illustrating newfound exoplanets since 1995, when she drew 51 Pegasi b, the first alien world ever discovered around a sun-like star. 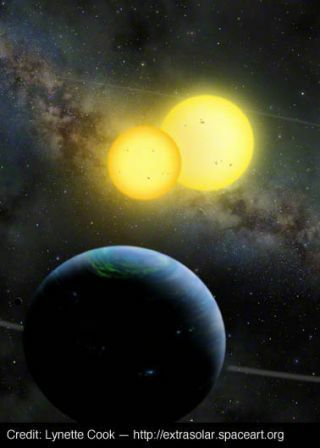 Since then, she has illustrated many other famous extrasolar planets, including the double-sun "Tatooine" world Kepler-35b and Gliese 581g, which may be capable of supporting Earth-like life if the planet exists (some astronomers remain unconvinced). SPACE.com caught up with Cook recently to discuss how she goes about drawing alien planets, and how her illustrations can contribute to humanity's understanding of these far-flung and fascinating worlds. SPACE.com: How do you envision what exoplanets might look like? All of those parameters have to go together. And then one can decide other things — like, if it's in the habitable zone and it's rocky, do I want to show that there could be water? If it's at the inner edge of the habitable zone, it might have water, but it's not likely to have any ice or any polar caps. If it's at the outer edge, it could have liquid water and frozen water both, which is kind of neat. If it's something that's very close in, then it would be very hot and could look molten. Terrestrial Planet at 55 Cancri: "For my book 'Infinite Worlds' I created some images presenting what could exist, given current scientific data. This example shows a water world in the habitable zone at 55 Cancri," Cook said. SPACE.com: Do you have pretty free rein when it comes to imagining these worlds, or do other people have a significant say? Cook: It's usually a combination. Sometimes the person I work with will suggest something, especially if it's a discoverer. He might say, "OK, this is going to be for a press release. I don't want to go too far out on a limb here, so we're going to show the planet only and no moons, because we don't know for sure that moons are there." If it's something that maybe is for Astronomy magazine or Sky and Telescope, then maybe the moons are OK. So it's going to be somewhat determined by what the end use is for a specific piece of art. SPACE.com: What's the illustration process like, from start to finish? Cook: It really is a lengthy process, especially when it is tailored to science, the actual science. Because when a job comes in, or even if I initiate it and want to collaborate — say, with [planet-hunter] Geoff Marcy or someone else — then there's initially a discussion period: Hey, I'm going to do this planet, this system; these are the characteristics, and what can we show? And then I'll do the final art, which again gets looked at and approved and maybe tweaked or changed. So it's not just a slapdash method; there are lots of approvals, especially for press releases. White Dwarf GD 362 Shredding a Planet: "Usually I am asked to create whole or mostly complete planets," Cook said. "This time I had to pulverize one, showing a white dwarf star ripping a world apart and incorporating its matter into Saturn-like rings." SPACE.com: How long does it usually take to go through all of this? SPACE.com: You get in on the ground floor of a lot of exoplanet discoveries. So if an astronomer finds something really exciting — an alien Earth, say — you may know about it before pretty much everyone else in the world. Cook: If I'm the one who's asked to do the art for it, I will know before everybody else in the world, except for the astronomers and whoever is putting out the press release. That's happened several times, and that's really fun. I'm given the embargo date, and then I can go to bed one night knowing the embargo lifts at, say, 10 in the morning. Then I can look at my computer, and all of a sudden here's the news all over the world. And I start getting messages — "Oh, Lynette, I saw your work!" It's fun, it really is. SPACE.com: Do you have any favorites? Do any illustrations stick out in your mind that were particularly fun to do? Cook: Well, it was really the first few I did that were the most fun. And I think that's because the whole study and discovery of exoplanets was so new, and so amazing. HD222582b and Moon: "Geoff Marcy gave a 'thumbs up' to my watery landscape idea since this planet is in a highly elliptical orbit. It shows that frozen water existing on a nearby moon would melt as the two bodies approach the star and warm up," Cook said. SPACE.com: How does your exoplanet art fit in with the rest of your work? Cook: My space art used to be traditional; that's how work at one time was done when I started out in the field. The space art ended up going all digital, because that's what clients seemed to require. At one point it was easy to do it traditionally, scan it, get the TIFF file or JPEG and send it off. And that can still be done, but not as easily as it once could, because changes have to be made very quickly. The deadlines and turnaround times are way shorter than they once were. So that's all gone digital. I miss doing art traditionally, and that's one of the reasons that I am doing fine art at this point. I just don't like being at the computer every day, every hour; it's hard to sit in one place and stare at a monitor, and I don't think it's physically very good for me either, frankly. SPACE.com: Do you think your illustrations can play a role in this new exoplanet revolution, and how people's perception of their place in the universe is changing? A shot of space artist Lynette Cook at the drawing table. Cook: Well, they already have. If you look historically at space art, and the role it has played, it is the early space artists who helped get the public excited about going into space, about leaving Earth's orbit. And it seems pretty clear that it is the early artists like [Chesley] Bonestell and others who helped make space travel and space exploration seem possible. I think today's space artists do the same thing. And with exoplanets, it is one of the areas of astronomy where it's really needed. These planets are so far away that we can't image them directly with any good resolution at all, and the only way for people to really understand what they might be like in a visual way is through the eyes of an artist. SPACE.com: And a lot of people who are only casually interested in science or space might not actually read the story about a newfound exoplanet. But that picture may stick with them, and that's the whole idea, isn't it? Cook: It is. And let's face it — there are some people who are very good with words and can really pick up on what text is trying to get across, but large numbers of the population respond visually and will get an idea or a concept visually much more easily than something written. SPACE.com: Hopefully we'll be able to take pictures of these worlds someday, so we'll know if what you and other artists have envisioned is actually right.